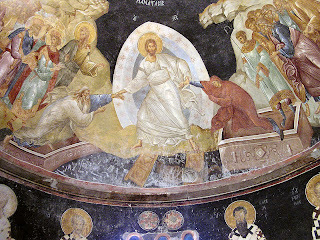 For those of you who follow me on Twitter, you may have noticed I my tweets about Byzantine art over the past day or so. I've been revisiting Byzantine art this past week - it's been quite a while since Justinian and I have hung out together. And I can always use more gold backgrounds in my life, right? 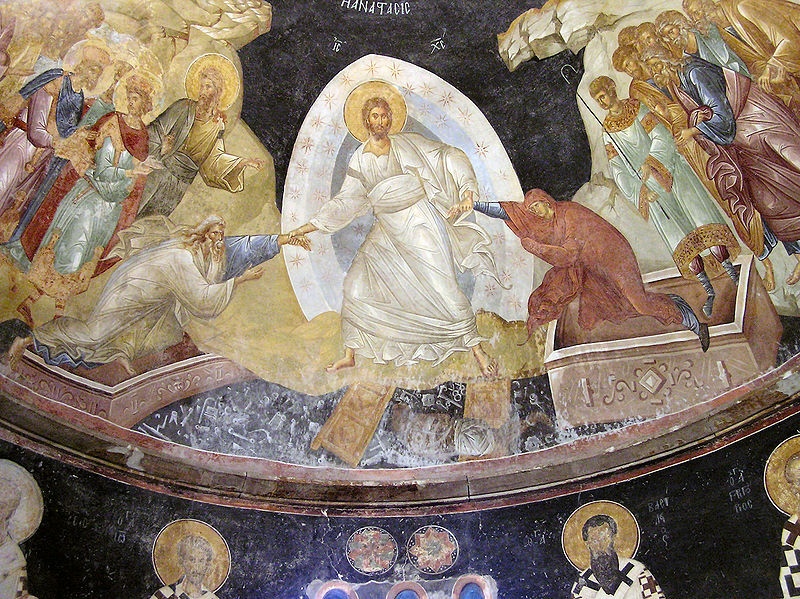 Here, Christ is shown rescuing Adam and Eve from their tombs. Other patriarchs, prophets, and kings wait on the sidelines - perhaps waiting their turn to be rescued by Christ. I like a lot of things in this painting, particularly that Christ and Adam are dressed in similar white robes. Since Christ was perceived as a "new Adam" to reverse the effects of the Fall, I think it's fitting that they are depicted in matching clothes. 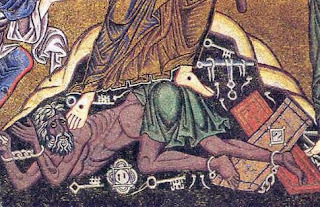 I decided to look at the Gospel of Nicodemus to see if there were any specific references to keys, locks, or the Gates of Hell. There are a few references, particularly Chapter V (XXI): 1-3. Christ announces his arrival at the doors, and Hell cries "unto his wicked ministers: Shut ye the hard gates of brass and put on them the bars of iron and withstand stoutly, lest we that hold captivity be taken captive" (Verse 1). The captive saints in Hell protest against this action, and King David reminds Hell that Christ is the individual who "hath broken the gates of brass and smitten the bars of iron in sunder" (Verse 2). The artist for the funerary chapel of Theodore Metochites really took the "in sunder" description to heart! Other Byzantine artists also depicted this scene, but usually with less fragments of locks and keys. Here are three other anastasis scenes that include some keys and pieces of the "bars of iron." I'm showing details of the images below, but also providing links in case anyone wants to see the full scene. 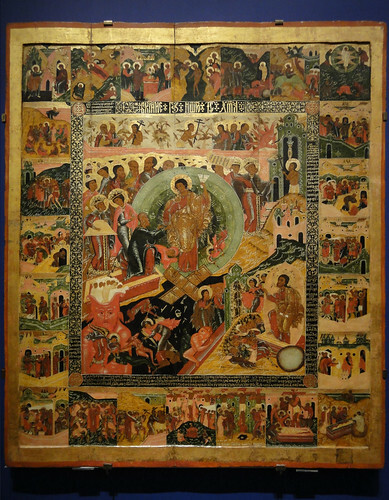 Detail of Anastasis, Russian icon from 17th century (Hermitage Museum). Detail image courtesy of jimforest via Flickr. These artists have left the Gates of Hell in shambles - it's no wonder anastasis scenes are sometimes called the "Harrowing of Hell! "2 If you know of any other anastasis scenes that have fun depictions of keys, locks, bolts, hinges and the like - please let me know! 1 George Fletcher Bass and James W. Allan,Serçe Limanı: An Eleventh-Century Shipwreck Vol. 2, (College Station, Texas: Texas A&M University Press, 2009), 449. Available online here. 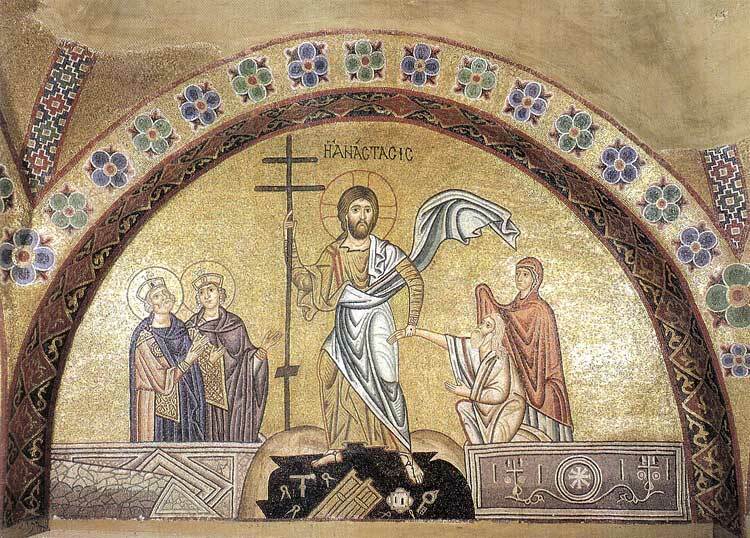 2 If you want to be nitpicky, though, I think it's more accurate to refer to Byzantine works of art as "anastasis." 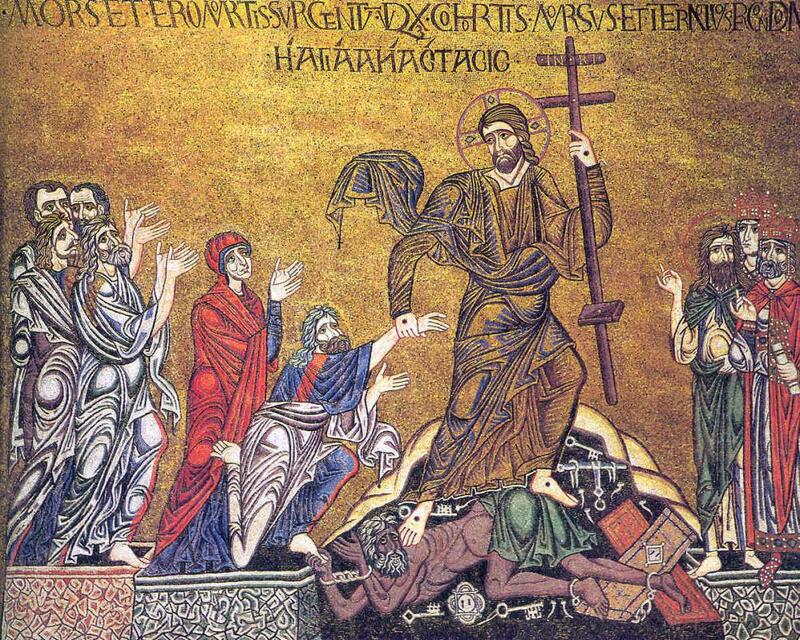 The term "Harrowing of Hell" is an Old English and Middle English term, so it doesn't perfectly apply to the Byzantine period.